Birds is the theme for the Twinsie Tuesday prompt today. 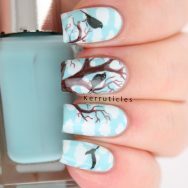 I’ve put some birds in a tree, after I saw this manicure by Wacky Lacki where she used the same Fake Tattoos of birds that I was planning to use. For the background, there was nothing better to start off with than Barry M Sky Blue for the sky. 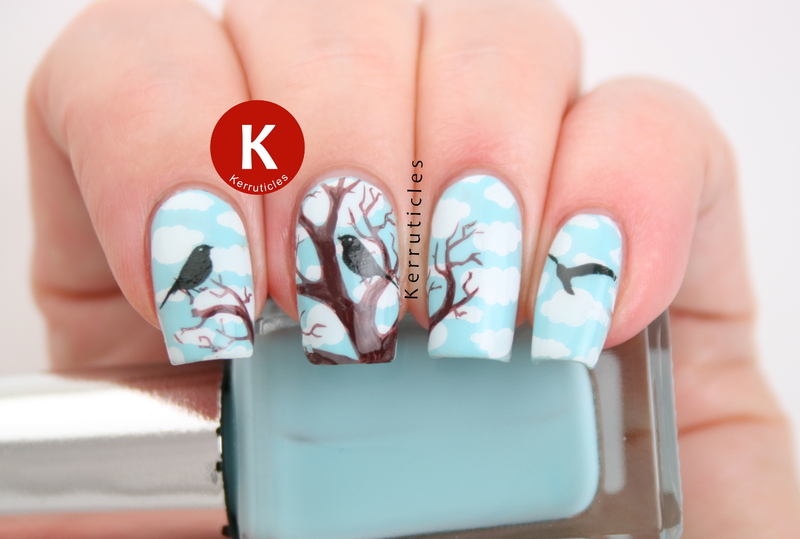 Then I stamped on some clouds using an image from my MoYou Nails Pro Board VII plate. I used the tree from Born Pretty Store BP-L015 on my middle fingernail and then used parts of the same image on the nails next to it to give the impression of branches spreading outwards. For the tree stamping, I used Barry M Cocoa and as it’s not a proper stamping polish, you could see the clouds through it. So I went over it a bit with a cut down detailing brush and some more Barry M Cocoa. I just painted roughly, so that it looked a bit like bark. 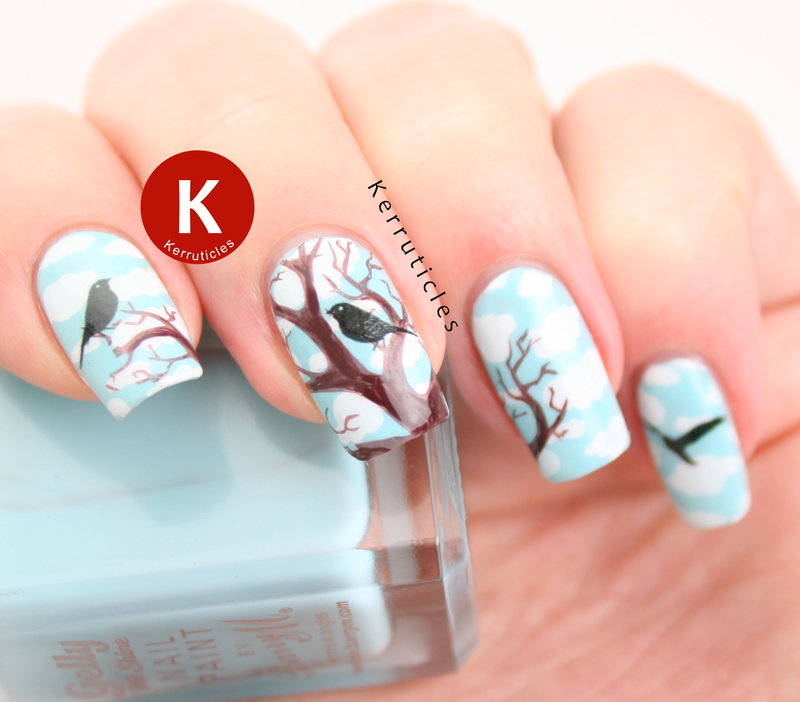 Finally, I added in my birds, using Fake Tattoos, which are effectively water decals. And I added one coming in to land on my little finger nail. My scene looks very wintry and bare, and I toyed with adding in some green leaves, but wasn’t sure my freehand was up to it. I didn’t want to ruin what I already had, so I called it quits and stuck with it as it was. The Fake Tattoos used for this manicure were sent to me for review. All views expressed in this post are my own, honest and unbiased opinions. These look fantastic. 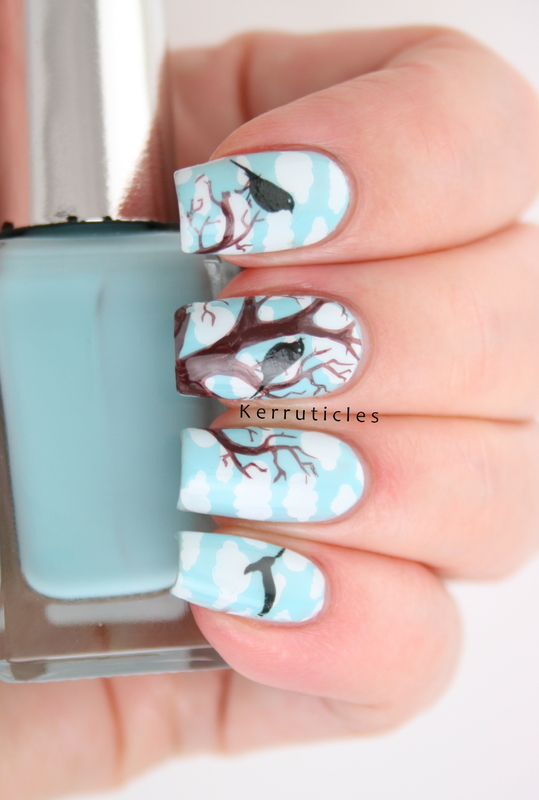 The scene with the birds and trees are nice. You did a wonderful job – looks gorgeous!! This is beautiful! The details in the tree are amazing!